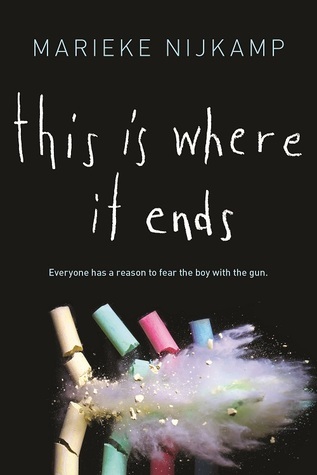 I got sent my review copy of “This Is Where It Ends” months and months ago, and in my overwhelmed state completely forgot that I’d put it aside to review. I came across the book again whilst watching a book-tuber video on Youtube and the name sounded awfully familiar to me. I had a little flick through my ARCs and found that actually, yes, I had been sent a copy for review. I decided to get started on it straight away as I’d heard SO many good things about the book, from both fellow bloggers and my friends. I was really excited to be finally getting around to reading it but to be quite honest with you, my excitement was short-lived. This book just really wasn’t for me. Its premise is fantastic. Different character perspectives in the minutes which follow a school shooting is a genius idea, especially considering the horrendously high amount of school shootings which happen on a yearly basis. I even quite liked the vast majority of the characters and how they contributed to the story. I wasn’t so keen on the “villain” and his motives for what he did seemed a little bit unrealistic, but i guess that’s appropriate considering the fact it’s a school shooting- the people who commit these crimes in real life have sociopathic tendencies with no real reason to do what they do, so perhaps this villains lack of reason adds even more to the terror. You get the gripping urgency of the text wide and clear and there’s absolutely no doubting that I got through it incredibly quickly. I’m not really sure why it was exactly, but something just fell seriously short. I felt as though, somehow, the book was trying a little bit too hard to cover every corner and appeal to every type of person, with immigrant characters, multiple lesbians, hispanics, even a character with lupus got a mention, and I think this effort to be so multicultural distracted from the main point of the book. The vast amount of point of views also confused me for the first half of the book and I had to keep flicking back to work out who was who. Maybe I should be more forgiving of this one, but it just seemed a little “too much” for one novel. I will give Marieke Nijkamp one significant plus point: she knows how to write a scene filled with panic and she does so incredibly well. The book WAS heartbreaking and quick paced, but that had to be the case for a book set over such a small timescale, and with such a devastating topic. I found the last scene in particular ridiculously poignant and thought-provoking, and that scene alone saved the book from being a complete flop in my eyes. Over the course of the book you learn about each characters backstory, which leading back to my previous point about getting confused about the characters, added to my confusion a little at first but eventually allowed me to easily distinguish between characters. I did enjoy the ways in which the characters all worked together to come to a solution, particularly as far as the scenes with Claire were concerned: she took charge of her group of track friends and ensured that they were kept safe from harm. I did find the relationship between Claire and Chris forming off the basis of a school shooting a little bit inappropriate, but I guess if you’re in a situation where you think you’re going to lose your life, a spontaneous declaration of love isn’t all that far fetched. The relationship between Sylvia and Autumn was nicely done, and both characters show sides of themselves which really changed my opinion of them as the book developed. I won’t say anything more as I’m sure some people will want to read this book, and they’ll enjoy it a lot more than I did, without spoilers. The book did leave me thinking about what I would do if I was thrown into a similar situation and to be honest with you, I’m still not sure now, writing this review a week or so down the line. It is without a doubt a tremendously difficult situation to manoeuvre. I do feel slightly guilty for not loving it in the same way that all of my friends did, but I guess that comes with the territory of being a book blogger. I’ve been reading so many different YA books at the moment that it’s becoming increasingly more difficult to find one which wows me on every level. Thanks very much to net galley for the ARC copy in exchange for this review. Next Post Book Review: The Art of Being Normal – Lisa Williamson | The Girl Gang Read of the Month for April.